Team Ireland’s Williie McGrath, a member of Waterford SO Club, from Kilmacthomas, with his mam Breda and dad Tom on his return from the 2019 World Summer Games Abu Dhabi at Dublin Airport. Photo: Ray McManus/Sportsfile. 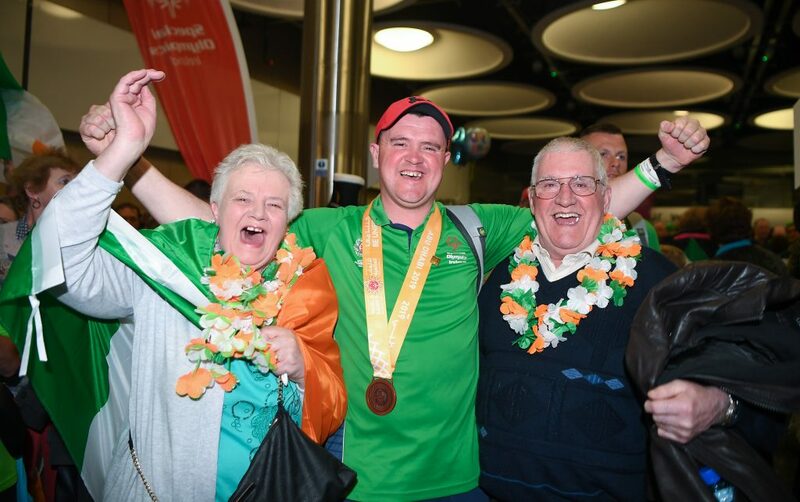 There were emotional scenes at Dublin Airport on Friday last as the 91-strong Team Ireland squad returned home to a heroes’ welcome from the Special Olympics World Summer Games in Abu Dhabi. The team were carrying some serious excess baggage, as they made their way into the arrivals hall, with a sensational haul of 86 medals (30 gold, 29 silver and 27 bronze). Greeted by rapturous applause from family, friends and fans, who turned out in huge numbers from right across the country, the athletes also returned with friendships and memories to last a lifetime. Amongst them were Kilmacthomas native and employee of Waterford Golf Club, Willie McGrath, who was the captain of the Irish seven-a-side soccer team that defeated Estonia 7-2 to take bronze at the games. The Special Olympics Ireland team consistently win huge amounts of medals wherever they go but to continue their wonderful run of success, they need our help. You can support future champions by Texting Athlete to 50300 to donate €4. Text costs €4. Special Olympics Ireland will receive a minimum of €3.26. Service Provider: LIKECHARITY. Helpline: 076 6805278 or Volunteer on our Annual Collection Day on Friday 5th April. Check out the Special Olympics Ireland Facebook page for more details and highlights of the game.